Semi-Permanent make up, also known as micro pigmentation, is a revolutionary method of inserting small amounts of pigment into the dermal layer of the skin in order to enhance a woman’s features. 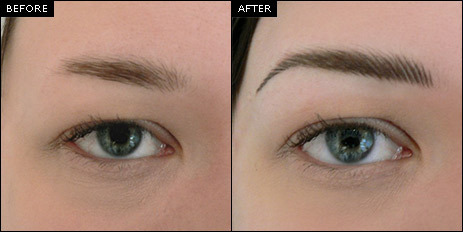 Semi-Permanent makeup typically consists of application of eyeliner, eyebrow simulation, and lip color. Additionally, there are semi-permanent cosmetic makeup procedures for beauty marks, scar camouflage and areola reconstruction. You can throw away your eyebrow pencils because we at Shumaila’s we will design the perfectly shaped eyebrows for you so you can go swimming, wear a hat, and go to the gym without having to worry about your eyebrows rubbing off ever again. First, your eyebrows will be redesigned with cosmetic pencils so you can visualize the shape. Then, we will apply the semi-permanent colour by tattooing each individual hair stroke one by one with the Feathering Technique to build long and short strokes, following the growth pattern of your natural eyebrows. Your design is original, done without the use of stencils. Shumaila never does the same design twice! When a woman’s lipstick comes off, her face looks so pale and her lips look shapeless. The lip colour procedure will bring fullness and colour to your pale lips. First, at Shumaila’s we will pre-draw your desired lip shape, then match it to your favourite lip colour. Lip liner and lip colour are the perfect solution to reshape uneven lips, adding fullness, and covering scars. Eye liner defines and enhances the beauty of the eyes. It makes the lashes appear thicker, even when mascara is not worn. To many people, the thought of never having to worry about smudging eyeliner ever again seems like a futuristic dream. We at Shumaila’s offer two options for eyeliner. The first is called an enhancement and is a thin, naturally looking line along the lash line. The second option is the eyeliner and is for those looking for more of a makeup look. At Shumaila’s we achieves this look by adding another line on top of the enhancement. Semi- Permanent eyeliner is delicately applied with a sterile applicator made specifically for fine, detailed facial work, utilizing the micro-pigmentation process. Colour is applied along both the upper and lower lash lines, creating a defined but soft radiance around the eyes. If a stronger look is desired, thickness of the colour may be increased gradually over several sessions. Shumaila offers the best and affordable rates for you to get a proper and best semi-permanent makeup service.